I love making stratas - those casseroles that are comprised of bread and fruit or veggies layered with cheeses (or not) and an egg custard. You make them ahead of time, which makes them perfect for entertaining, and when you're ready to eat, all you do is bake and dig in! This recipe is like a strata, but it also reminds me of French Toast. The eggy custard soaks into the bread, in this case, flaky croissants, and the crisp edges and tender interior is very much like French Toast. I added blueberries and an oatmeal streusel topping for extra flavor and interest. You can make this recipe with other fruits if you'd like. Try using blackberries, raspberries, or even strawberries. Peaches or nectarines would be good too. Peel the peaches - you don't have to peel nectarines. 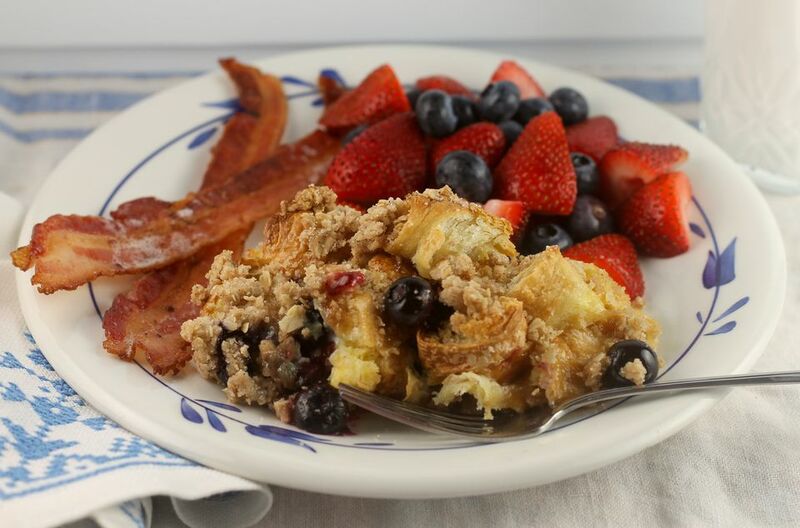 Serve this wonderful breakfast or brunch casserole with some crisp bacon and a fruit salad made using the best produce you can find. Add a mimosa or orange juice and some hot coffee for a fabulous meal everyone will love. Tear or cut the croissants into 1" pieces and place in a greased 2-quart casserole dish. You can use more croissants or less if you'd like, depending on how many it takes to fill the dish. Add the blueberries to the dish and distribute them evenly among the croissant pieces; set aside. In a medium bowl, combine the milk, cream, eggs, 1/3 cup sugar, and vanilla and beat well with a wire whisk until combined. Pour the egg mixture slowly and evenly over the croissants and blueberries in the baking dish. Press down gently with your hands to make sure the croissants are coated in the egg mixture. Cover the dish and refrigerate at least four hours or overnight. In another medium bowl, combine the flour, brown sugar, cinnamon, and oatmeal and mix well. Cut in the softened butter until particles about the size of peas form. Cover this bowl and refrigerate. When you're ready to eat, preheat the oven to 375°F. Uncover the croissant mixture and sprinkle it evenly with the oatmeal streusel. Bake for 25 to 35 minutes, or until the streusel is golden brown and the croissant mixture is slightly puffed and set. The temperature should be at least 160°F as measured with a food thermometer. Roll Up These Breakfast Enchiladas — They Rock!